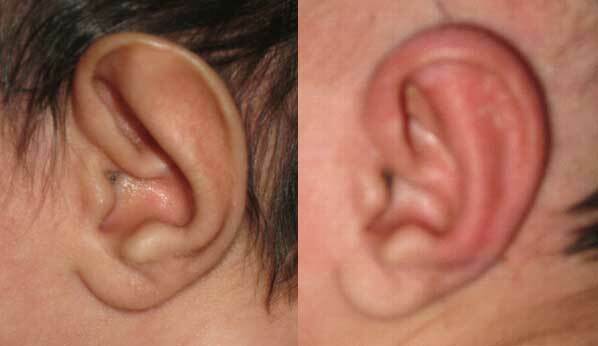 Some studies have reported that 70% of ear deformities will either worsen or remain the same over time as the child ages. Either or both ears can be involved in any of these processes. Historically 2 and 3 have been treated preferably shortly after birth with the application of splints that were made for each patient for ear molding. Since the baby has its mother’s estrogen flowing through its blood stream for a month or so after birth it is thought that this estrogen makes the baby’s young cartilage malleable. Therefore if you hold the infant ear in a specific position for a month or more it will then keep that shape after the splint is removed. If you to wait until later in childhood or teenage/adult years the splints will not work and surgery will be required which never gives as good a result as splints applied during infancy. 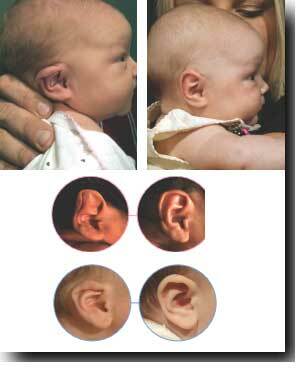 Now we have commercially available ear splints called Earwell that can be easily be modified for each baby, are easy to apply and give consistent good results. These Earwell splints stay in place about 14 days and 3 serial applications are usually sufficient to correct infant ear deformities by ear molding. That is a 6 week long treatment protocol. The results after application of this splint have been very good in infants under 2 months of age, less so in 2 to 4 month old infants and only partial correction in those over 4 months of age. 6 to 8 weeks of treatment with the splint are required and the earwell splint adhesive loosens so the earwell has to be replaced about every 2 weeks. A study from Baylor in Houston showed over 95% of 250 newborn ear deformities were satisfactorily remolded within a 6-8 week treatment period using the earwell. Most medical health insurance plans cover treatment with the earwell splint.